We really enjoyed our stay on the island of Crete. 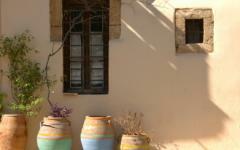 The old Venetian town of Chania was very charming and maintained a lot of its old world charm. 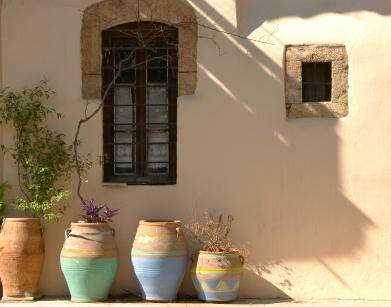 The hotel this Greece tour operator booked for us, Casa Delfino Suites was a true delight. It was situated conveniently in the town's square, walking distance to many sites and restaurants. The Cretan cuisine was delicious and we tried a few restaurants that had Middle Eastern influences, nothing like I've ever tasted back in the States. We loved the off the beaten path beach of Elafonissis on the western shores of Crete. The water was pristine, blue, shallow and calm cradled in white sand that I walked out 50+ yards and was still able to keep my ahead above the water. The drive to/from the beach was breathtaking with dramatic landscapes along the coastline. I definitely recommend a visit to Crete!. On the whole they did a good job planning the trip for my husband and I, but there were a couple of misses mostly due to miscommunication (see below). I would say the hiccups could have been avoided if there was live conversation to supplement our mostly email correspondence. Definitely, Crete! See comments above. I would definitely have a live conversation with the tour company at the onset of planning and at the end, I would require a phone call to review the itinerary in its entirety. This will insure the client knows exactly the distance needed to drive and hotel locations relative to town center is well understood and agreed upon. The hotel that this Greece tour operator booked in Santorini (Filotera) was not the one I expected since there are 2 hotels on the island with the same name. Moreover, the location of the hotel was far away from the main town of Oia which is where we wanted to stay. Moreover, the hotel manager at Filotera was not friendly and reacted to our questions with short and often sarcastic responses. This was not a fun start to our honeymoon. Luckily, the rest of the trip went more smoothly and we met many friendly people. The second misstep is the ferry we took from Santorini to Crete landed in Irakilo which was a 2.5hr drive to Chania where we were staying. Not only were we not informed of the distance that we'll need to drive but the fact that our ferry landed at 8:30pm made our late night drive even more taxing. If we would have known, we would have prefered to stay in Irakilo the first night and make the drive to Chania the next morning. Other than these 2 instances, the rest of our trip was fine and the tour operator did try to make it work throughout our trip when we had questions and asked for hotel upgrades. Our representative in Athens was especially gracious and helpful.